David Venable was born on the 12th November in Charlotte, North Carolina USA, and is a foodie, chef, and TV personality, who is probably best known for his appearance in the cooking show “In The Kitchen With David”, on the QVC channel. He is also recognized as a broadcast journalist. He has been an active member of the entertainment and food industries since the 1980s. So, have you ever wondered how rich David Venable is, as of early 2016? According to authoritative sources, it has been estimated that the total sum of David’s net worth is over $1 million, which has been accumulated through his successful involvement in the entertainment industry as a journalist and host of a cooking show. Obviously, his net worth will increase in the forthcoming years as he continues to build up his professional career. David Venable was raised with two siblings in his hometown by a single mother who worked as a nurse. After matriculation from Charlotte Latin School, he enrolled at the University of North Carolina at Chapel Hill, from which he graduated with a BA degree in Radio, Television and Film. Soon after he finished his education, David started working as a broadcaster for the WTAJ-TV, in Pennsylvania, and later moved to the WOAY-TV of West Virginia. After that, David`s net worth increased by him working as a host of his own talk show, entitled “Action Newsmakers”. Before he joined QVC, David also worked for several years as a host of the Children’s Miracle Network telethon, which also added a lot to the overall of his net worth. David’s life changed in 1993 when he was approached by the QVC channel, and without thinking, he accepted the offer to work as a promoter of food products on the network; however, he soon started to work his way up in the station. Year after year, his career progressed, which increased his net worth steadily, and also boosted his popularity. 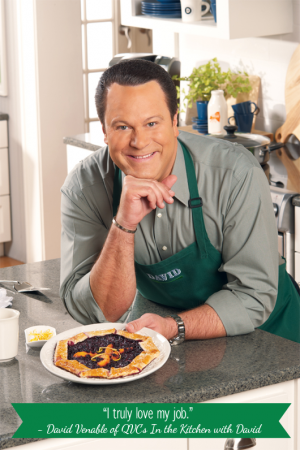 Over the years, he has hosted several shows, however, the show “In The Kitchen With David” made him one of the most popular hosts of gourmet shows in the world. The show airs twice a week, with average audiences extending to over three million, and thanks to the popularity of the show, David’s net worth has been in constant rise. To speak further of his accomplishments, David Venable released a book in the fall of 2012, entitled “”In the Kitchen with David: Comfort Foods That Take You Home”, which contains more than 100 recipes. This creation also increased David’s net worth, as it has become one of the best-selling books published by the QVC. If to talk about David Venable’s personal life, there is no information in the media about it, as he keeps it private. However, in free time, he is active on his official Twitter account, on which he has a great number of followers.